The best thing about Alternative Control? 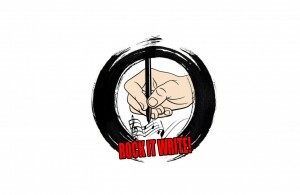 One minute we’re writing about local metal and the next minute we’re writing about sausages! 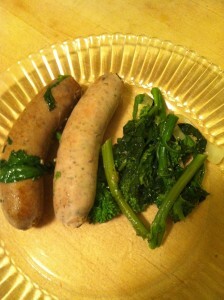 Broccoli rabe and sausage is one of my all-time favorite meals — so when my husband and I picked up some rabbit and elk sausages (yes, you read that right) on a visit to upstate New York, I had to attempt recreating my Italian stepmother’s version of the dish with this unique meat. 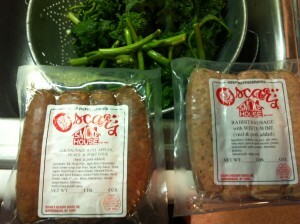 The sausages came from Oscar’s Adirondack Smoke House in Warrensburg, New York. If you ever visit the Adirondacks, you have to stop at Oscar’s on your way home to pick up some goodies. Their cheese spreads, jerky, smoked trout, and “More Than Mustard” are unreplicable, and they have a really impressive selection of beef, pork, and cold cuts. (Well, unless you go on a Monday – in which case, everyone else went on Sunday and bought everything.) The elk sausage and rabbit sausage were on the specials menu and we got a package of each. 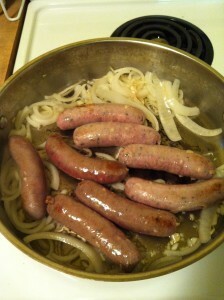 The recipe below is mostly my stepmother Gina’s method, with a few changes. Adapt it to your own tastes and enjoy! Coat a large, deep frying pan with olive oil and heat on medium. Chop onion and add to pan. Chop garlic and add to pan. 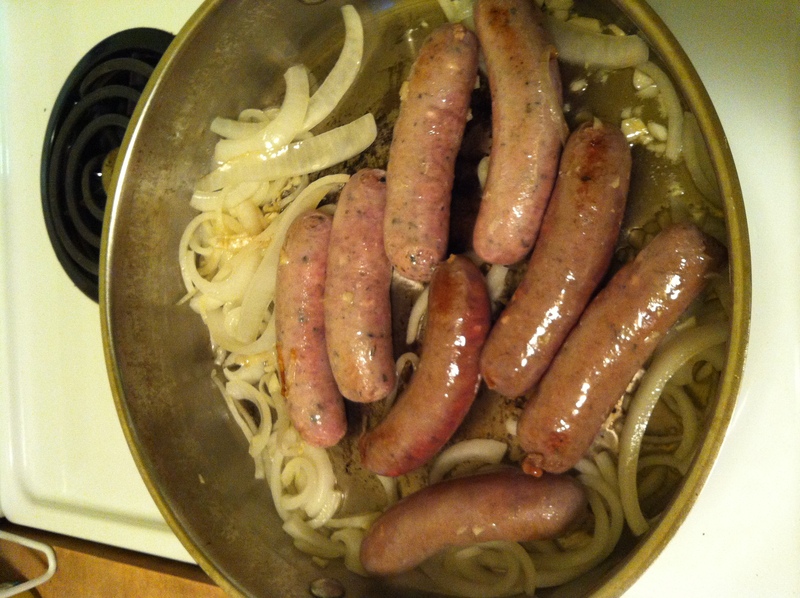 Once onion and garlic are cooked, turn up heat, add sausage and sear on all sides. Put a pot of water on to boil. When it boils, cook pasta according to directions, drain, and set aside. 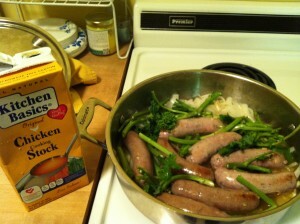 Wash broccoli rabe; cut off the bottom half-inch of stems and discard. Then separate the remaining length of stems from the leafy parts. 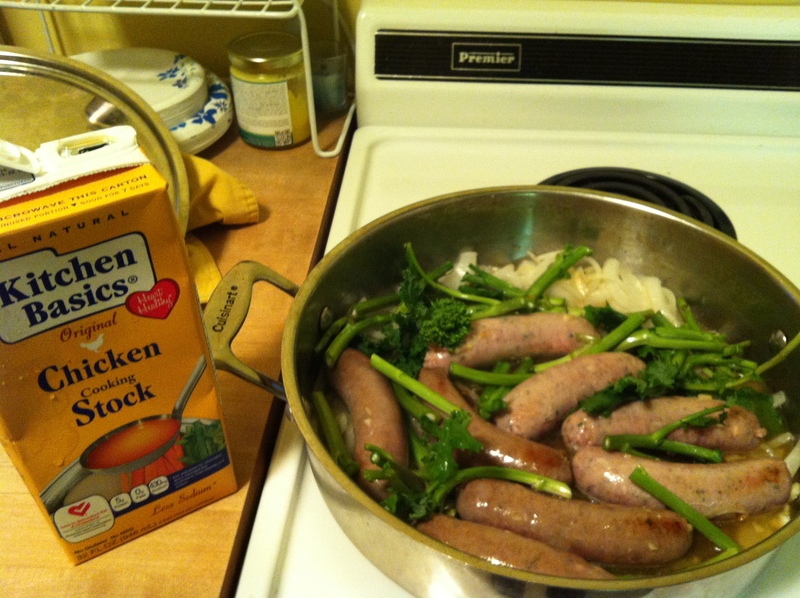 Add stems and chicken broth to pan with sausage. (Gina doesn’t do chicken broth.) Lower heat to medium, cover, and cook ten minutes. Add salt, pepper, and leafy parts of broccoli rabe. Cover and cook to desired tenderness (10-20 minutes), stirring occasionally. Mike and I both agreed that we liked the rabbit sausage better than the elk. It had a sweet flavor that reminded me of the chicken apple sausage I’ve gotten from Stop and Shop’s “fancy” meat case, only not gross. 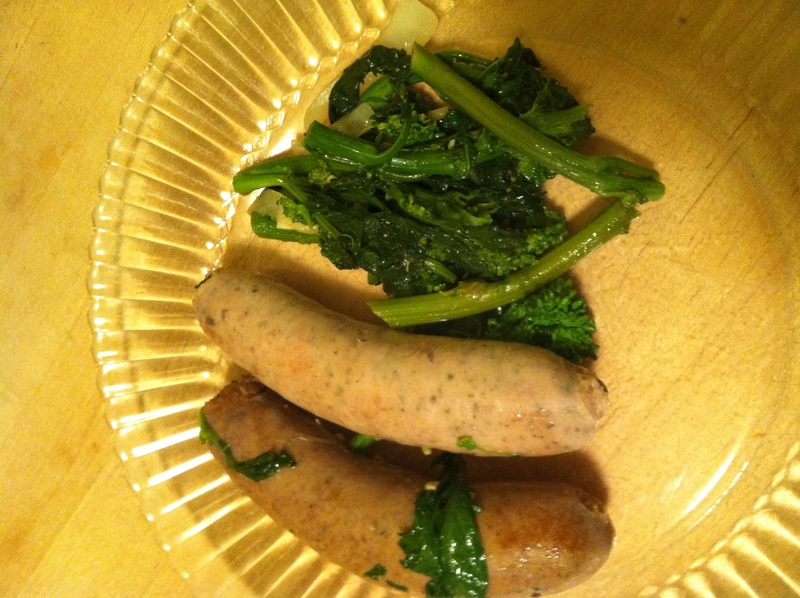 As cliché as this sounds, the elk sausage was a little gamey for my tastes, but the strong flavor paired well with the broccoli rabe. If there’s one thing I’ve learned about Italian home cooking, it’s that everyone has a different version of the basic recipes and everyone thinks that their way is the best. How do you cook your broccoli rabe? What are some of your other Italian favorites? Oscar’s Adirondack Smoke House — online ordering available. This looks so yummy! I have never had rabbit, so I would love to try it! Thanks for letting me know about it! I’m always trying new foods…this looks pretty good!